The Backpack is a human and spiritual development program for all ages. This program teaches psychology and spiritual skills and well being, through three sections: relationship with self, relationship with others, and relationship with God. Taught by Rachel and Annie, Father Darragh, Kathryn and Margaret, our spiritual and human teachings hit the bull's eye. The Backpack Essential Tools for Life has received a formal Imprimatur. This gives us great confidence to offer the program in Catholic arenas. As you know, an Imprimatur is a statement by a Catholic Bishop that the material is consistent with Catholic teachings. 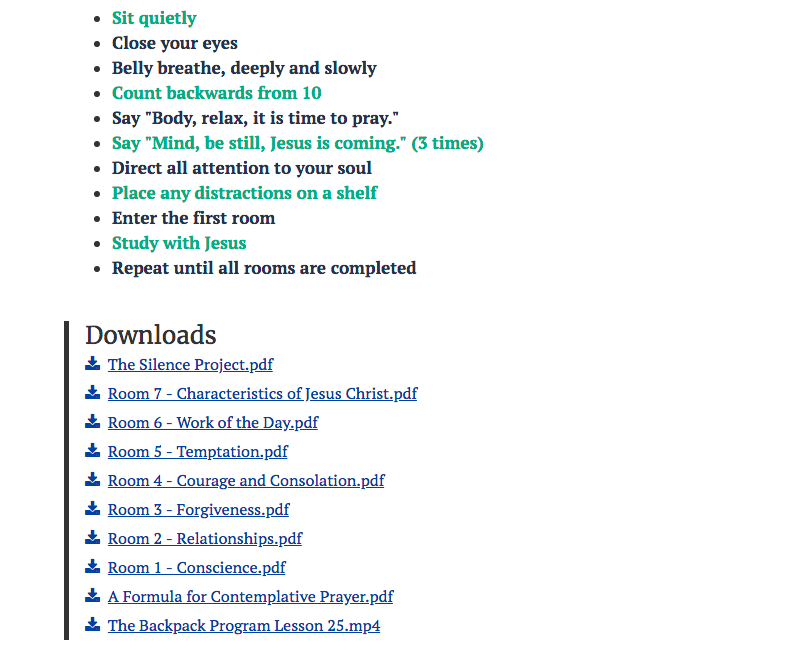 The whole program is available in a digital version so you can sign in and out and complete the teachings in your own time or buy it for a young person in your life. “I wish that I had this information, these tools, when I had my young family! I would have had more awareness and been more mindful of how I was dealing with certain situations, at various stages of development. In this media-created culture, people need this formation. People are going with the flow not fully aware of the choices they have in their own life. Therefore, they're not making good choices. We are like robots. For me, taking the Backpack course has given me great confidence to speak about it. It has empowered me to offer something different to people to encourage them toward faith-based living. It's fresh, new, gentle, and inviting. I'm so excited! I look forward to it every week. I feel like I’m being nourished at the level of my soul. I shared The Backpack at a parish meeting recently. Taking the program has empowered me to take steps to make this package available in my own parish” (Eleanor-53). “It doesn't matter what age you are, The Backpack changes you. It has enabled me to identify my feelings and to give clarity to feelings that I was not able to name before. The Backpack helps you to verbalize and understand why you behave the way you do. You start to notice your patterns of behaviour and ask yourself why and where that pattern came from in childhood. The shame and guilt teaching helped me to be less hard on myself. The fact that we're all imperfect… it’s so liberating. Adults are striving for perfection instead of excellence and it make life very hard for them. The Backpack teaches you the difference between mature and immature thinking, and how to choose mature thinking. I would highly recommend this program to any adult” (Geraldine-56). Parents, grandparents, do you have good thinking skills? Listening skills? Are you able to stop looping thought patterns and contemplate yourself positively, with hope? Are you confident about your own boundaries? Have you taught your children and grandchildren their four personal boundaries, physical, mental, spiritual and sexual? If not, join the growing number of adult participants who all say “I wish I had this program sooner and I’m glad I have it now.” Sometimes, we do not realise that we are negatively scrutinising ourselves until we stop. How can we help the people we care about if we do not have the tools ourselves? Do you know someone who needs this program? The up-to-date spiritual and science-based curriculum gives you and your family the gift of self-awareness and resilience. Every participant agrees that completing the Backpack program builds confidence! Take a look at some of the issues people struggle with today and see if you know someone who could use The Backpack.